We’ve been listening to the AT&T Press Event this morning regarding the AT&T/T-Mobile agreement and it’s a doozy. First and foremost, let’s be real clear. 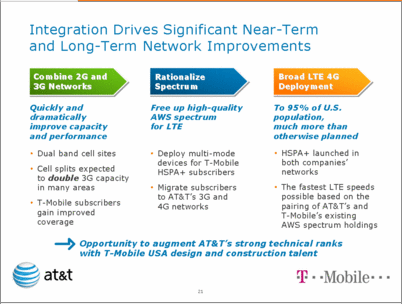 AT&T is going after T-Mobile spectrum in a big way. Complementing AT&T’s own 700 MHz LTE spectrum with T-Mobile’s 1700 MHz AWS frequency will help AT&T deploy LTE to 95% of the American population. That’s 46 million more people than AT&T had hoped to be able to roll out LTE to, based on their current spectrum holdings. There was plenty to be said about how this deals makes sense from the standpoint of complementary technologies and how that will ensure a smooth transition for the consumer. Improving network quality, an obvious eyesore for AT&T, is the big kicker here. They are going after spectrum and are obviously paying for it. AT&T expects data usage to jump 8 to 10 times in overall usage in the next 5 years and they believe this deal gives them more than enough spectrum to handle that kind of growth. Another salient point is that the new combined entity will offer “dual-band” phones that will allow them to offer service on combined towers providing best in class coverage. There were plenty of sound bites regarding the improved coverage opportunity for T-Mobile customers. Since both companies run common technologies, both AT&T and T-Mobile will benefit once the deal closes and networks are integrated. So how is this good for the customer? 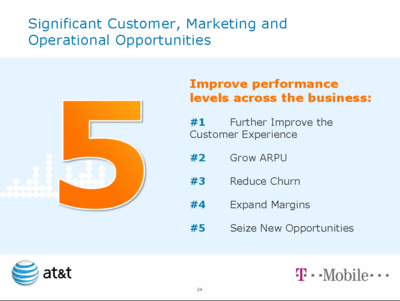 According to Ralph de la Vega, AT&T Mobility CEO, there are 5 ways to show how beneficial this is for both companies. 1) The combined entity will enhance the customer voice and data experience with world class network experience with HSPA+ and LTE capabilities. Paired with a “best in class” portfolio of smartphones and connected devices, AT&T believes this will be a great deal for customers. 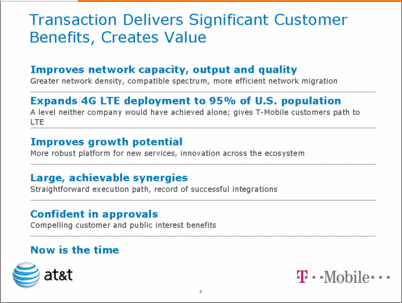 As an extra bonus, AT&T believes they offer a superior value with a 90+ million customer m2m network along with rollover. 2) This allows both companies to grow the average revenue per unit thereby making the deal financially viable for the new combined AT&T to thrive. 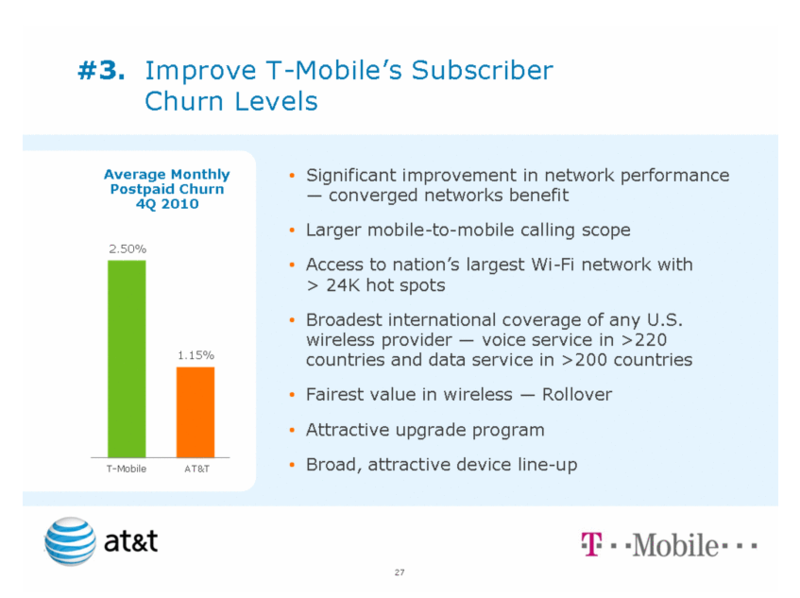 3) Improving churn will require significant focus on the T-Mobile front as AT&T hopes that with the nation’s largest mobile 2 mobile scope, they can entice customers to stay. AT&T is convinced with their experience from the Cingular merger they are prepared for the challenge in immediately working to reduce customer churn. 4) Expanding the margins of the companies. This is a strictly financial thing. Yawn. 5) AT&T combined with T-mobile can seize opportunities such as providing LTE service to 46 million more people including rural areas that AT&T otherwise wouldn’t have been able to provide. So there you have it, a summary of today’s AT&T Press Event. So what did we learn? Well, I don’t think anything here was earth shattering as we fully expected that AT&T and T-Mobile would combine spectrum to provide a greater LTE and customer experience. The semantics of how that would be performed was of course that T-Mobile’s AWS band would be retooled for LTE and HSPA+. Customers will hope to gain an enhanced coverage map with less gaps in coverage and, of course, less dropped calls and more reliable data. Also stated in the Q & A portion was that AT&T would not keep all T-Mobile towers. Overlapping towers such as those less than a mile from one another may be looked at as cost-cutting measures. Customers with AWS handsets will be migrated into newer handsets that run off 850/1900 band to make way for LTE on the AWS bands. It’s apparent there are plenty of unknown questions up to and including what happens to employees and staff from a combined company. This is likely to dominate our headlines for the next few days so stay tuned as we try and go more in depth and learn more! ← Will An AT&T Acquisition Of T-Mobile Really Happen? What will this site become? Can’t be ATTNEWS.COM, that was registered by AT&T in 2005. Any suggestions? formerlytmonews.com is available. We have to STOP buying T-Mobile phone because it will be totally useless soon. No, it just means next year you’ll get any new phone you want from the new lineup of “dual-band” phones for free. I’ve lived through AT&T acquisitions, they always do the same thing. You’ll be fine as far as phones go. Buy what you like now, and expect AT&T to give you a new phone for free next year. Maybe now I can get 3G in my state (MS), something little ‘ol T-MO could never do. AT&T 3G outperforms what I had with Tmo and what I have now with my VZW phone for work. Its wierd as hell that jackson doesnt have 4g let alone even 3g but meridian and gulfport/biloxi does…. There doesn’t seem to be any information on what will happen to UMA/Wi-Fi calling. This is a main selling point for T-Mo (for me!) Does anyone have any insight into what DeathStar will do with this after the acquisition is complete? uma is a feature of the phone. hang on to it. it is a function of the phone only if the carrier offers it. For expample, I have a Tmo Blacberry 9700 that can connect via UMA. I also have an unlocked BB Torch 9800 which, after a bit of programming, can also connect to Tmo via UMA if I put my Tmo SIM in it. BUT, it cannot connect to ATT via UMA because ATT does not offer UMA. So, while the phone has to be programmed accordingly, the carrier also has to offer the feature. So, back to my question, does anyone have any insight into whether ATT will disband TMo’s UMA connectivity after the merger? 100% correct. My nexus won’t do UMA, but my “old” blackberry bold will. “Expanding the margins” means only one thing: higher rates. They say that directly. “This allows both companies to grow the average revenue per unit” means they’re counting on reduced competition to give them free reign to increase pricing. And the fact that they say “both companies” suggests that rates plans post-buyout will be even higher than AT&T’s current rates. growing the revenue per unit does not necessarily mean the cost of the rate plans or the handsets is going to increase nathan. its like buying in bulk at sam’s club or costco…the more you buy the lower the price per unit is. by having more customers, the company costs per customer goes down, which means the profits being made on each customer goes up even without increasing the price of the rate plans or handsets. in that respect, it could turn out to mean rate plans being lowered and more savings for our customers. think positive. T-Mobile hasn’t let me, as an employee, down yet and I’m sure there are clauses built into that contract to protect customers and employees. Remember, TMO prides ourselves in putting our customers first. besides, everything is still pure speculation right now so there is no need to hit the panic button just yet. I’d like to agree with you. I do think that, over time, rates will go down. This has been the trend over the (relatively short) history of cell phones. Cost-per-minute and data costs have dropped dramatically over the last 10 years. However, I don’t expect to keep the same “customers first” mentality that we love about TMO. You said it best when you said that TMO has never let you down. Remember the new company won’t be TMO, it’ll be ATT. Has ATT ever let people down? Yup. You are focusing on the pricing (revenues) aspect of things but there are cost consolidations happening too. That is how margins are expanded. Prices may go up but but that is NOT the only way margins are expanded. Well if their expenses go down, then they’re pass along cost savings to the consumer, right?? ?…you really think they’re going to do that? Hahahahahahaha…now how is the moron? How is the moron? Are you asking about the moron’s well-being? I still have a concern of I just started a new t-mobile contract 3 months ago should I want out will they let me walk without paying a fee and should I stay do I get to keep my plan or if I renew will I be forced to take a plan they offer and pay more or scale down my plan and take less? T-Mobile employee here… I would recommend staying right now. The deal has not been approved as of yet, so T-Mobile is T-Mobile is T-Mobile. We will continue to honor your current rate plan and contract agreement as T-Mobile until the buyout is complete. If you choose to leave before then, you will be charged your agreed upon ETF in the contract that you signed. Once the buyout is complete, you are locked into your current rate plan until you choose to change it. Your wireless provider cannot force you to take a new rate plan because you will need to agree to the new terms and conditions of the new contract proposed. Legally, they cannot force you to do so. I also want to say that we do not know yet if AT&T will embrace our attitude of listening to our customers and changing the business based on feedback. Give us a chance as we move into this new era of exponentially amazing coverage, and have faith in us T-Mobile employees that we will still provide you with the customer service that we are renowned for! Tmo Emp here also. Tech. Good wording on everything. We are still Tmobile. Yes, we are concerned about our jobs, but till they lock the doors we are still coming in and taking your calls. Till that happens, contracts are still active and there will be no waive of ETF. I see good things coming from this merger in the sense that the Bands and coverage will be increased. I sure do hope that Customer Service for Tmobile takes the lead though, because as everyone knows, we are better than ATT, based on our own knowledge, customers, and this little thing called JD Powers. As for all these questions, they are right to be asked, but so far…not a lot has been said, especially to the employees. Just know that when we know, when David knows, then you will know. What will happen with those of us on an EM+ plan? We aren’t under contract so are we going to be forced to a new contract? That is my biggest concern. Only if you choose to upgrade a phone through AT&T (you can buy used or unlocked phones still), or choose to change your rate plan. Again, your wireless provider cannot FORCE you into a contract. You must agree to do so. yet another TMO Emp here…jack and tiffany…perfectly worded thoughts. I’ve said this from the time we found out….AT&T wants our JD Power’s awards….who wouldn’t??? I somehow doubt they will dump all the TMO ideals and values and lose the opportunity to get them. There is a reason we have those awards. It’s because we are the BEST at what we do. And Jack, as you said, unless and until they lock our center doors, we will be there taking care of every one of OUR customers in every possible way. For those of us that stick with AT&T after the process completes, I know we will all stay committed to our core values and continue to provide the world class customer service that has earned us those awards, no matter what changes and challenges we face. You will be grandfathered in to any T-Mobile plan and contract that you currently have should you stay. It’s not the “current” part that I have an issue with. I have been with TMO for 6+ years and have a pricing plan no other carrier can come close too. My worry is that after my current contract expires, I will be told that I have to have a ATT plan and lose my what I freely admit is a sweet deal due to my loyality customer status. Plus TMO CS is the best there. I loathe the death star with a passion, and am really worried. That is absolutely correct. I have five lines of service with Family My Faves 1800 minutes, Family Unlimited Text for $19.95 and T-Mobile Web at $5.99 per line. I don’t buy contract devices and what I buy is designed for my plan, not my plan for my devices; it’s a savings of over $125 a month. Find a plan now that works and stay with it through hell and high water. I worked for AT&T during the Cingular merger (All while keeping my T-Mobile plan) and the only time you were forced to change your plan from a Cingular plan to an AT&T plan is when you upgraded your phone. So everyone should absolutely upgrade their phones and extend your contract, you are just locking in your great Tmo plan for longer! The part that confuses me and hopefully someone here can clear it up for me is this: “Customers with AWS handsets will be migrated into newer handsets that run off 850/1900 band to make way for LTE on the AWS bands.” So they are buying T-Mobile for this spectrum, that’s obvious. So let’s say I buy a Samsung Galaxy 4G, which has the AWS and LTE spectrums. So if I bought that phone today since it has the 1700mhz band would I be required to migrate into a newer handset that runs off 850/1900? that’s how they’ll get around honoring many existing tmobile contracts. they’ll offer you a new phone for cheap or even possibly free but in order to get it you’ll have to sign a new higher priced with fewer features contract with att. that’s why i’m going to sprint when my contract runs out next march. while i’ll still be paying about $25 more with sprint it’s much better than the $75 dollars more i’ll have to pay att. the nexus will still work on either network. They are going to give the same bull the verizon gave me as an Alltel employee. “Your job is safe no one is going to loose there jobs, small print until the merger is complete” Then you walk in one morning to see your desk has been packed up for you and some of your co-workers. I really hope for the best on this. Yeah of course they will have more coverage and spectrum to offer more is common sense but at what price. If you really want your voice to be heard about keeping T-Mobile’s customer service employees PLEASE contact both companies!!! The more voices heard regarding the customer service, the better the likelihood of that being a reality. As an employee for T-Mobile I am a little scared myself because of the buyout. I am hoping that more and more customers will take the initiative to speak out regarding their concerns so that employees like myself and my friends will not need to worry about the possibility of losing our jobs. I pray that you and all your fellow associates in customer service get to keep your jobs through all this. You and your CS department have worked so hard to take care of your customers, You deserve the best! and should be well informed ahead of this deal that no matter what happens your job is secure! I agree wholeheartedly!!! We can make this an amazing opportunity for everyone involved! Thank you to all of our loyal customers! We would not have been this successful had it not been for your feedback to improve as much as we have. Amazing coverage is on the way, couple that with 11 out of the last 13 JD Power and Associates awards for customer service excellence, as well as the title of one of the most ethical companies in America (the only wireless provider given such an honor). What could be better? didn’t anyone read the press release about the merger At&t will have 100% ownership of T-Mobile USA..
You are correct but thats most likely a pipe dream for all us TMO customers. 1) There is less competition around, too, so we (AT&T) are going to be charging you more. so now Big Red gonna buy Sprint? You may have hit the nail on the head! lets please hear more about how this will affect TMobile employees. there is a reason we have won so many JD Powers awards that AT&T has not…..TMO takes care of us, we take care of our customers….its all about that CE&O. Is AT&T going to take all this into account or are they going to come in and lay everyone off? they keep talking about cutting costs….does this mean they will be cutting all of our TMO benefits in order to cut those costs? that’s the big question for me. lots of tmo stores are going to close where there’s an existing att store. as far as the call centers, who knows? tmo customer care is several orders of magnitude better than att and, at least in idaho, att customer care is outsourced to a 3rd party company while tmobile has a call center in meridian. the possibility exists that the outsourced company will lose the support contract since att will own the tmo one. still, there’s a year ahead of us where everything might change. Att understands the success of Tmo’s training culture and is going to retrain att reps using the same model. Then the shaft comes. it was fun. So how will this affect long time T- Mobile customers? My unlimited talk & text plan isn’t offered any more. Will I be grandfathered or told my plan will cease to exist in 14 months and I have to have a plan with separate texting? anyone who already has any of the newer smartphones doesn’t need to worry about this. for the most part the only ones that will need to upgrade ASAP is anyone with the older model basic phones. most of our (tmo) phones now are world phones and can run on almost any band. The voice service is the same but the data is on different frequencies. So if you get a new smart phone then you will have to get another in a year. Yes you will have to get a new phone. AT&T already said so. And I know 20 people with 45 phones total who are leaving T-Mobile because of this merger. Expect to see the new tmobile smartphones and for that matter, probably the iPhone 5 to run off qualcoms pentaband radio which covers the 850,900,1700,1900,2100 MHz spectrums. The nokia n8 and c7 and e73 already use these chips. Kind of makes the n8 and c7 look like good choices. Maybe htc will employ the same technology in the pyramid. The only good that would come out of this is potential for a great LTE network, but besides that it’s not looking pretty. We can’t count on the prices of such a network being outrageous, seeing as how AT&T already charges an arm and a leg for the sorry service they offer now. Hey, this news just broke yesterday and all the articles clearly state that its going to take at least 12 months to go through, but you know… let me go ahead post a highly-detailed question about rates and plans because in some Bizarro world in another dimension, a time traveler moved forward 2 years and came back and is able to answer my questions. 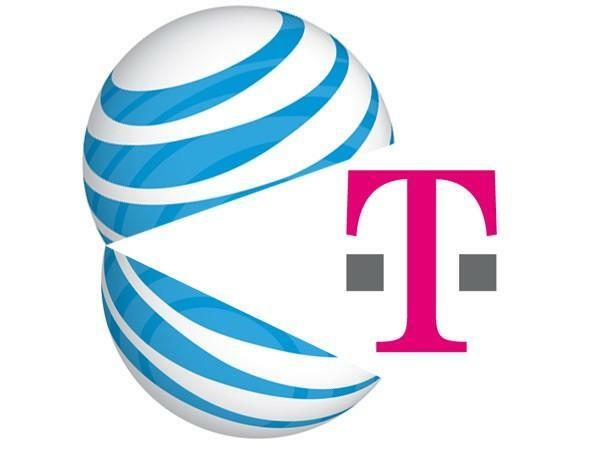 If AT&T fires there own customer service reps and use T-Mobiles customer service reps I would be willing to accept a higher bill but not 30%. Remember to that AT&T doesn’t allow WiFi calling on it’s phones even though it completely possible on their present network. They also delete your voicemail automatically after two weeks. AT&T is getting the most out of the Deal: more voice bandwidth and use of the Tmo AWS bands for LTE. T-mobile customers get very, very little. Everybody on T-Mobile will keep their plans if they so wish it; as in my case, I will. TMO employee here, nothing has been released about availability of services yet. however, think about it this way….ATT, if the buyout is approved, will own the technology to keep the features available. right now the hope is that they are going to combine the best of both companies. our award winning customer service and our 4g speeds + AT&T’s network coverage = incredible service for our customers. ATT needs to come out and say that they welcome TMO’s long time customers, and we will honor yout old grandfathered plans as long as your a customer. If they try and force me into a bloatted, throttled ATT plan, IM outta here. If everything will stay the same, i’ll stay. They won’t do that because it would make their present customers made. They have to shift you into a AT&T plan. OR wait until you need a new phone and then force a change. The T-mobile phones work with AT&T voice bands right away but the 3G bands are different. An smart phone that wants above edge speeds with AT&T has to upgrade to an AT&T phone and most likely change the Tmo plan to an AT&T plan. You are indeed correct; most towers that offer both services are in fact have their arrays on the same towers. A few of us have been through this a time or two like when T-Mobile gobbled our service here in Auburn-Opelika via then VoiceStream which prior to it was PowerTel. To this day there are users from VoiceStream who pay $2.99 for complete internet service; I pay $5.99; works flawless. I have tried very, very hard to stay within my plan’s voice, messaging and data and bought devices to accommodate my plan and to date; no problems. AT&T buying T-Mobile isn’t the end of the world; though I completely understand the frustration. If what is printed on these information websites is true what will change I believe is a step in the right direction and as I posted a moment ago; to have access to AT&T’s 850MHz spectrum in rural areas will be more savings for us as we currently use two cellular carriers for both out of town and in-town. Just yesterday, I requested a SIM unlock for a spare Rhodium (Touch Pro 2)…Tilt 2 if on AT&T and a MyTouch 3G original; both work flawlessly on AT&T’s spectrum and particularly on AT&T’s 850MHz network deep in the woods of Georgia. There are more than our fair share that don’t have access to 3G and/or 4G and accept EDGE and GPRS as a way of life here in the woods and have access to DSL; there is no cap on AT&T DSL and where we have access to free public Wi-Fi, we use it. Call it Plan B.
Jim.. Att will honor the tmo customers contracts… You need to think of it this way… If they increase prices it’s a breach of contract and they risk losing hundreds of thousands of customers to verizon or sprint (since they will be able to cancel contract without the ETF)… on the flip note waiting for a tmo customers contract to end then forcing them to switch over to a att plan will also sway them over to verizon or sprint… It will be more advantageous for them to honor the contracts.. My brother is an exec at tmo.. He told me att sole reason for this is their network can not handle the amount of customers they have (which is why they had to stop their unlimited data).. They looked at Tmo and seen they have space to accommodate their growth since tmo is not over saturated.. It’s a much cheaper fix then trying to add more to their own network..
LOL what about your job? i agree. I am too a T-Mobile employee, and i know for a fact that coverage will be superb and service will be alot better. If both come together and gain each other’s experience from T-Mobile’s award winning JD Powers customer service and ATT’s coverage we will be winning both JD Power awards from customer service to coverage and also being the fastest network in the U.S. with LTE and HSPA+. Sure there might be a monopoly but the government should put a cap to that, but knowing today’s economy the government might be eying the money for now since prices on everything is going up trying to “save” the economy of the U.S.
How’s that since ATT’s call centers are mostly located in India. T-mobile overall has the best service. I hope ATT sees that and keeps there customer service. Yes they are not perfect but overall they do a great job. I cannot imagine having to call and speak to the dreaded att reps. Worst of all look at how much i’ve spent over the years on tmo phones. I have 4 new phones in my house, I wanna see how long they will actually support them. I hope they wake up and turn this down. T-mobile employees 37000 employees if we loose half of those imagine what that will do to the unemployment in the country. Why is everyone so focused on the customer. This is GREAT. Buy up the data plan now. AT&T always grandfathers in the old plans. Read the WSJ. Back up the truck and load up the plans. David get to have his iphone on 3g. Oh yeah! I don’t feel like I have enough info on this to make a decision – Anybody here at TMOnews want to take up the challenge? oh yeah. mifi for 60. gigity goo when ATT had to eat my contract. Finally we will have the speed. Here’s to hoping AT&Telekom USA doesn’t go thru!!!!!! I will remain optimistic about this until my plans and coverage are affected. If my plans stay the same, I’m ok with that, but if they rise, then we have problems. Same goes for Coverage. I still stand behind my statement, whatever company gets the Nokia N950 or a Meego Device, that’s who I’m going with and since the N950 already is rumored to have GSM frequencies, then it seems like now the only choice is AT&T-Mobile. The Nokia N8 already has a “Penta” band SoC, and I have read that it works on both TMO and AT&T 3G networks. I would assume that the N950 would also. you agreed to a contract at a specified price, for specified features, for a specified period of time. if they cannot follow through, you don’t have to either. Well if this happens we will have to say “goodbye” to tmonews! On one had they say this is good for competition (lower prices) and then say it will “grow the revenue per unit”…in other words they will collect more dollar’s per cell phone. They hide it by saying that more people will move to higher priced plans with smart phones, but those of us who already have smart phones will see our bills jump 10%-20%. 10-20% on average, perhaps. The T-Mobile plans are typically a way better deal than what AT&T offers. With Even More Plus, I save about 40% compared to AT&T or Verizon, and end up with a minute bucket twice as high as their nearest option. While I paid more for the devices up front, the savings comes pretty quickly. Cmon man did y’all really think this was gonna be a sweet transaction? So much for my $529 Nexus S I just bought 2 months ago. Yea I feel bad for people who just renewed their contracts. I’m considering staying until the summer then see what devices come out. Same boat here. Bought my Nexus S 45 days ago. If in fact the merger goes through and in fact the phones must be upgraded, Nexus S will be a fine looking paperweight with zero resale value. Tmobile branded Nexus S works in most other countries! It will still have a resale value as long as you are willing to ship it overseas! They will subsidize the change. Use your heads. This is great except for the folks that get the hammer. They just opened a reseller store in the hood today. Right hand doesnt know what left is doing. Load up on the contacts folks as they will have to honor. Worst case is 2 years down the road. But what if the deal falls through? What if U.S. regulators squash the deal or AT&T finds the nearly $40 billion premium too hefty? T-Mobile customers, and Deutsche Telekom, will still make out just fine. In a conference call this morning, AT&T announced that if the merger is unsuccessful, it will pay T-Mobile USA $3 billion for its troubles. But it doesn’t stop there. AT&T will transfer to T-Mobile any of its AWS spectrum that is “not critical” to its initial LTE rollout and enter a roaming agreement with the carrier that will give it coverage in areas where T-Mobile does not overlap with AT&T. Again, T-Mobile customers will benefit from more spectrum and more coverage. The big question that most T-Mobile customers will have — especially those who don’t know or care what “spectrum” is — will be, “will my monthly wireless bill increase?” And those are answers we may not have have until long after the deal is done. In the meantime, what I can tell the T-Mobile faithful is this: whether the deal goes through or not, you will definitely win from a network prospective. what .. will .. happen .. to .. the .. employees ……….. and i hate to lose my $35/mth employee plan. $35 A month? What the heck do you have on your plan? Mine is $16 tops with PHP. The Empire is striking back at the Rebels. AT&T has been broken up before in the ’80s (i.e. the 1st Death Star), they rebuilt again, and now they’re gobbling up what I think is the valid competition out there because of their system compatibilities. I’ve been with T-Mobile since it was Voicestream in 2001. I’m not sure if this deal is the best for its current subscribers. Yes, I see wider coverage and more access to newer phones as pluses, but the most important thing for me is price. That’s the reason I’m still with T-Mobile. If my plan gets grandfathered, that’s great, if not I’m going to have to look elsewhere. whats good with a grandfathered plan if you will not be able to use your current phone because comparabilities issues, at&t will force you to buy an other phone and you will have to sign a new contract. This is not good for TMO period. ATT gets all the benefits, we have all been trained to talk about our customer service which is awesome but bottom line is – ATT will get rid of a lot of employees, (call centers and stores) because they don’t them. No need to keep duplicate stores, call centers or kiosks. As far as the rate plans go, once the merger (yeah right), takeover is complete customers have 30 days to figure out what they want to do and cancel without penalty if they so choose. Otherwise you can keep your rate plan…but, as soon as you need to add new features or change your phone, you will have to change your rate plan. The aforementioned is how it usually works. I’m an 11th year T-Mobile employee and I fear the worst. I’m guessing since AT&T is union, their employees will retain their seniority over the newbie disposable T-Mobile employees. All we’ve done over the years with thin staffing, long hard hours worked and missed family time will be for nothing. If it’s an AT&T employee or T-Mobile employee, I’m sure T-Mobile will get the shaft. Dont be so sure. Its a way for ATT to squash the unions. I started with ATT BELL after college and went thru it all. More than you know. Trust me. It shall be they that get el shafto. Say so long to the Union hacks! Everybody talks about improved data and coverage, but what about customer service? The original AT&T, though it was a monopoly, had excellent customer service. It was broken up due to complaints from other companies trying to compete – not due to any customer issues. (I’m old – I know!) This AT&T isn’t AT&T – it’s primarily the old “baby Bells” and Cingular, merged and having taken the name because customers believed in AT&T. The Bell companies and Cingular had terrible customer service. I’ve been with TMO since 2002, after leaving AT&T and Sprint due to issues with my wireless accounts. I’ve had only a couple of issues with TMO in 8 years, and all have been quickly corrected to my satisfaction. You TMO employees on here (and elsewhere) are great! You know what you’re doing, and you answer questions with a smile. Nobody at TMO has accidentally turned off my account and taken 2 weeks to turn it back on (as a different account number, since the old one was now no longer valid), situated my account at a wrong address, given me someone else’s account and repeatedly told me that I was high or something because I told them my Internet was working fine while they insisted that it was not even turned on, billed me for a closed account and took 6 months to correct the issue (each month I had to call them and have them move my payments to the correct account while the correct account was being marked as unpaid and scheduled for shutoff), and more… I have had dry DSL with AT&T for only 3 years and have had all these issues and more. I’ve had to deal with their clueless customer support at least 2-3 times per year (plus once a month for that 6-month long debacle). Lovely, eh? I’m definitely going to be “churning” if AT&T buys TMO. I don’t have wireless with them, or U-Verse, because I don’t want any other account issues to handle. If TMO had something that could run my home network, I’d have dropped the fake AT&T and never looked back. We were just waiting to see how our friendly, knowledgeable Magenta’s new MiFi device would look. Now, we have to wait to see if TMO gets lost in the bowels of the most horrible company I’ve had to deal with in the last 3 years – just like my DSL accounts were. By the buy this was all telegraphed when they stopped working the backhaul. Tmoisslow was all over this. Why should they. Brilliant move on their part. ATT will do it as LTE. Keep talking about that 42M modem. Yeah, like that will happen. Can you say dupped!!!!!!!!!!! the government should do something RIGHT this time, and not allow at&t to buy tmo! this will 1) limit competition 2) create a monopoly 3) some people will lose jobs. besides, if they say no at&t will have to give TMO 3 BILLION DOLLARS!! that will really help with tmo’s struggling company. plus, at&t said they would give tmo roaming things, making tmo’s coverage on par with at&t’s (well thats what tmonews said at least). so everyone hope the gov. says no. we keep our great prices, evade at&t’s horrible (customer) service, get better phones (that money could help– tmo will be releasing a whole bunch of phones at once soon- like seven new ones anyway), and get better coverage. im praying ‘at&t-mobile’ does not go through. We can, as consumers, have the right to petition. Even though we are not stockholders, we are shareholders within the background! I’m sure churn will be greatly improved since there is nowhere left to go. I despise AT&T. They project increased data usage . . . which they’re then going to strangle in the cradle through usage caps, both mobile and DSL. I’m sure it will go through. It has been decades since the government saw a merger it didn’t like. Antitrust law barely exists any more, and what little there is left is managed by agencies that have been captured by the industries they regulate. The clear endgame of AT&T’s strategy is to lock you into a world where all options for data access except those owned by AT&T are inordinately expensive. In the end, your data will be metered (this is what the DSL move is all about) and the meter will run faster for non-AT&T sources. I’m fine with this decision. T-Mobile in their press statement made it clear that our plans won’t change and it’s not like who among us has a say in all of this anyway? If..if the combined companies now merge all their coverage areas together; right off the top that saves my family a chunk of money; currently AT&T and T-Mobile do not share roaming areas where towers are located in rural locations and small towns throughout Alabama and Georgia well away from cities of any size. I look forward to being able to have an AT&T signal where there is no T-Mobile signal and they merge their coverage. It was a good run while it lasted….for us…it was PowerTel, VoiceStream, T-Mobile and sometime within the next two years, AT&T. It’s amazing to think AT&T’s former baby bell NYNEX now Verizon is its overall main competitor now; first the big divorce and now everything appears back as it once almost did a couple of decades ago but only in name only. Sadly that isn’t true. If you are a Tmobile customer without 4g bands in your phone that support AT&T, you will be forced into a new plan… I know I wont be able to keep my non contracted plan with unlimited data. This change is not for the better, but for the worse! Iam confused. So are they saying after the merger only tmobiles aws band won’t work only 4g lte and hspa+ will work? If so then all of tmobiles hspa+ phones will still work? Since AT&T and TMOBILE uses different DATA BANDS, AT&T state that they WILL NOT service TMobile data bands. So if you decide to keep your 3G/4G phones to use with AT&T, you will only get EDGE data service. This is where all Tmobile customer will be forced into AT&T dictatorship non-unlimited data plans. Yeah, SnittyKitty – they say that now. My bank was recently acquired by another bank. For the couple of years that the merger took to go through, they kept saying “everything will stay the same, only the name will be changing”. The merger completed in September, 2010. In October, they sent out notices that the fee schedules and account types were all changing, effective January 1, 2011. When we got notice in February that the new bank is now being acquired by another bank, we started moving everything into a credit union that’s been around for ages with excellent customer service. The point is that they can say what they want until the merger is completed – then they’ll be able to change what they want regardless. And, they will. Congrats on keeping your $2.99 plan so far, though. We had one of those, too, til we got smartphones and they started requiring a new data plan with every smartphone. Things do change, and I can accept that. But with the service I’ve had with AT&T, if it has to be Verizon ’cause no one else is left, that’s what it’ll be – or we may consider going without cell phones once again. Ouch! Cricket? Boost? ??? “Expanding margins” isn’t a “yawn” if you’re one of the countless employees — including the ones who give us T-Mobile USA’s award-winning customer service — who will get laid off in the quest to cut costs and expand the margins. I hate to say but I work for A ( . ) & ( . ) and those of you fortunate to have T-Mobile, an honest company, are about to get bent over and F****D. Jump ship while you can.